“My Facebook feed looks pretty different to yours,” a cotton farmer told me over the phone. It was all just speculation at that point, a turbulent rising fear amongst Australian farming communities – friends of friends hearing whispers that a huge protest was brewing. “Families were going to bed scared,” the farmer explained. On Monday morning, vegan activists staged nationwide protests. On the topic of farming, who are Australia’s invisible farmers? Listen below. Post continues after podcast. They hid inside abattoirs in the dead of the night and chained themselves to machinery. They were wearing black, and holding signs that read ‘Watch Dominion,’ a documentary exploring animal farming in Australia. It’s not the first time farmers have felt victimised. In fact, Mamamia struggled to find farmers who would go on the record to talk about this topic, fearing retribution. Protesters snuck into abattoirs and blocked intersections on Monday in a nationwide day of protest. Image: Getty/Instagram. Ellie* works in the wool and sheepmeat industry, and told Mamamia she&apos;d spent many a restless night being unable to sleep, after copping abuse from animal activists for her choice of career. "Am I really a &apos;murderer&apos; &apos;unethical&apos; and &apos;immoral&apos; for farming animals?" she asked herself in the darker moments. "[The protests] ignore the fact the rangeland used for grazing livestock won’t be used for anything else, meaning that removing livestock farming from the area also removes skills, knowledge, stewardship/environmental management from the area. "It ignores the fact that agriculture also creates oxygen. "It ignores all the bi-products created from animals. Animal agriculture exists for far more reasons than people wanting to eat meat. "It ignores the issues of mono-cultures from cropping the same food crops. "It ignores the fact that livestock utilises food waste as well as turning plants we can’t eat and water we can’t drink and land no one else wants to live on into something life sustaining." "Yes, I farm animals for a purpose, which eventually means they will all die. Everything living eventually dies. Expecting animals not to die is like going to any town in Australia and expecting there to not be a hospital or cemetery. Arguing I’m unethical because I make money from the death of animals makes me wonder: do I extend that logic to doctors, nurses, vets, funeral homes, coroners etc?" NSW farmer Kim told Mamamia; "I know of farmers who are living in fear of what may happen at their farm." 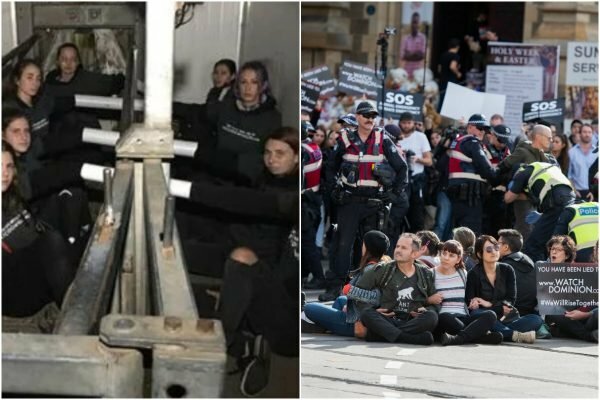 The vegan activists responsible for Monday&apos;s protests have created an "Aussie farm hit list." It lists 6000 farms and businesses. Kim says, it&apos;s an attack on families and their safety. 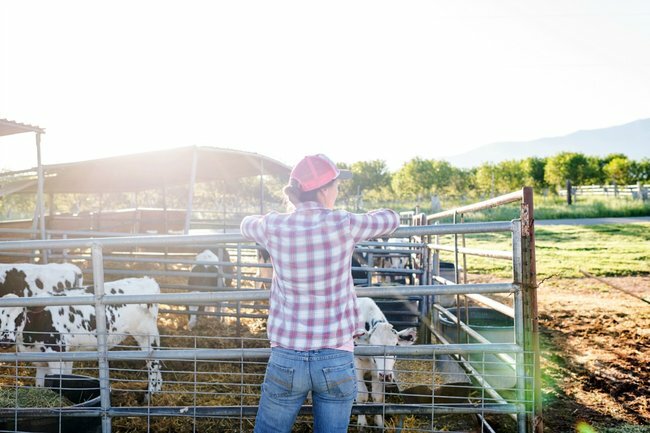 "It is blatant intimidation of the men and women who live and work on family farms and in agricultural businesses, not to mention the intimidation of children who also live on family farms. Family farms are the farmer’s home," she said. The night before the protests, the Gippy Goat Cafe in Yarragon Victoria announced on Facebook it was shutting its doors. "Our staff and customers have been subjected to nearly 4 months of constant harassment, vile statements and threats from the abusive vegan activists," owners John and Penny wrote. "Our farm will continue to operate as before, but is no longer open to the public. We are truly sorry for any disappointment this may cause," they said. Fellow farmers rushed to their side, sending messages of support. Morgan gives an interesting insight. She lives and works on a beef farm in New South Wales. "I am originally from a beach community and a member of PETA...I was vegetarian for years. I met my husband and continued with my view of “save the animals” but then I started working at a dairy and helping on beef farms and helping in chook sheds and actually understanding why farming happens the way it does. My whole view changed," she told Mamamia. She gives the example of sow stalls. Vegans say they are "cruel," but Morgan thinks differently. "They’re only kept in them for a very short period of time and they still have access to their piglets. I couldn’t tell you the amount of times I’ve walked into our pig pen and 10 out of 11 piglets are dead because the sow laid on them or stood on them or even ate them," she explained. 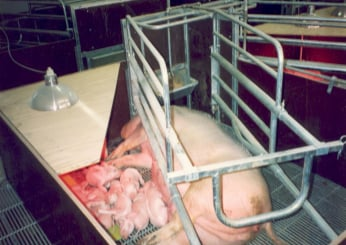 An Australian pig breeding stall. Image: DPI. Mamamia has found that what many farmers get most upset about, is the accusation from activists that they "don&apos;t care about animals." Ellie in particular resents that comment. “We do care about our animals. We care so much that we continue to dedicate our whole careers to bettering their lives and the standards of farming in Australia. "Every action we take, every day of work, is about looking after and caring for our animals. That is why we continue to work in this industry, because we love and care about it,” she told Mamamia. Kim hates the fact it&apos;s an &apos;us against them&apos; war. "Farmers don&apos;t have a problem with people being vegan, what the issue is, is that extremists are using veganism as an excuse to invade homes," she explained. "They are breaking the law but calling it a "peaceful protest". It&apos;s not peaceful, it&apos;s scary. The vegans I know are embarrassed by their actions," she told Mamamia. "Your inconvenience doesn&apos;t compare." Australia&apos;s animal protests from a vegan&apos;s point of view.